Unexpected illnesses or injuries in your pet can be tough financially. The cost of diagnostic tests, surgeries, and ongoing care can be expensive! While it is comparable in price to human medicine, most of these expenses are covered for ourselves. Unfortunately for our pets, there is no OHIP. But, there is pet insurance. There are various companies that provide insurance for our pets - depending on your coverage plan they can even cover things such as annual wellness exams and routine care (most basic plans just cover illnesses and accidents). We have compiled a list of Pet Insurance companies available to you. 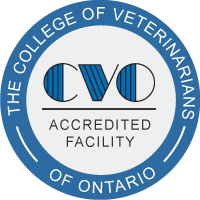 The OVMA provides a fact sheet in regards to pet insurance. They include questions to ask providers to ensure you can make a well-educated choice on who you decide to work with. Please click on the company's logo to visit their website. But not everyone has pet insurance. And sometimes, accidents and emergencies happen, and often times people fall on financial hardships and have difficulty finding the ability to pay for care. As we cannot extend credit to our clients, we do offer financing options through Petcard (iFinance). Petcard is simple, fast and convenient. There are three ways to apply - online (click the image above to be redirected to their website), via fax (simply fill out a form provided at our clinic and fax it to 1-888-689-9862) or they can process an application over the phone (just call 1-888-689-9876). They can approve you in as little as twenty minutes, so there is no wait. There is no down payment or collateral, they have high approval and competitive interest. Their fixed monthly payment plans of-+-fer terms from 6 months to 5 years. One final option for Veterinary Financing is the Farley Foundation. This company assists clients by subsidizing veterinary care for their pets. This company works off donations and therefore only works with owners that are eligible, and there is a $1000 limit per year per Veterinary Clinic. Eligibility falls into four categories: Seniors receiving GIS (guaranteed income supplement), disabled persons receiving ODSP or CPP Disability, abused women enrolled in the OVMA SafePet Program, and individials receiving assistance from Ontario Works. Pet owners do not apply to the Farley Foundation - your Veterinary Clinic must apply on your behalf. If you are not eligible for PetCard but fall within eligibility for Farley Foundation, please contact us.